Life has been busy outside of my site, which is why I've resorted to posting twice weekly. But hopefully as soon as my work schedule eases a bit, I'll be back to posting daily. I know I have a serious back log of recipes to share! Next week, I plan on gearing up to the upcoming Superbowl with some tasty bites perfect for a touchdown... so stay tuned. A special thanks goes to the lovely folks of Cabot Cheese for providing me a sampling of their wonderful products to play with in the kitchen. Cabot has quite a few different cheddars, including classic, aged and flavored varieties.You can use whatever you prefer but this recipe was exceptionally good with the Cabot Smoky Bacon Cheddar! Preheat oven to 350 degrees. Lightly grease a baking dish with cooking spray and set aside. In a dutch oven over medium high heat, add oil. Once hot, add onions and garlic, sauteeing until softened. Add ground beef and brown. Drain and transfer back to dutch oven. Stir in onion powder, garlic powder, salt and pepper to taste. Add beef broth and macaroni. Heat to boiling and once boiling, reduce the heat to a simmer and cover pot, cooking for 12-14 minutes until the macaroni is al dente. Do not drain. In a medium pot, melt the butter. Whisk in the flour to create a paste. Slowly add the milk while continuing to whisk until mixture is thickened. Add the shredded cheeseand stir until melted. Season with salt and pepper to taste. Pour the cheese sauce into the dutch oven and stir to combine with the hamburger and macaroni. Add the crumbled bacon. In a small bowl, combine breadcrumbs, butter and chopped parsley. 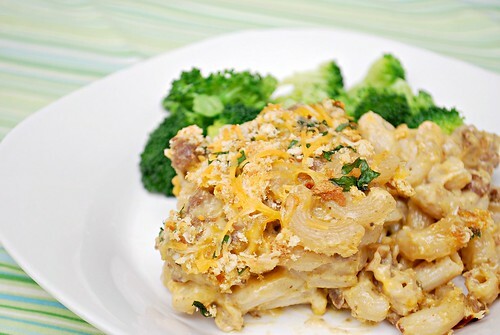 Transfer cheeseburger macaroni to prepared baking dish and top with breadcrumb mixture. Bake in preheated oven uncovered for 25 minutes or until golden brown on top. Serve hot. Well Joan we are clearly on the same wavelength as I just posted a green chile bacon cheeseburger dip! 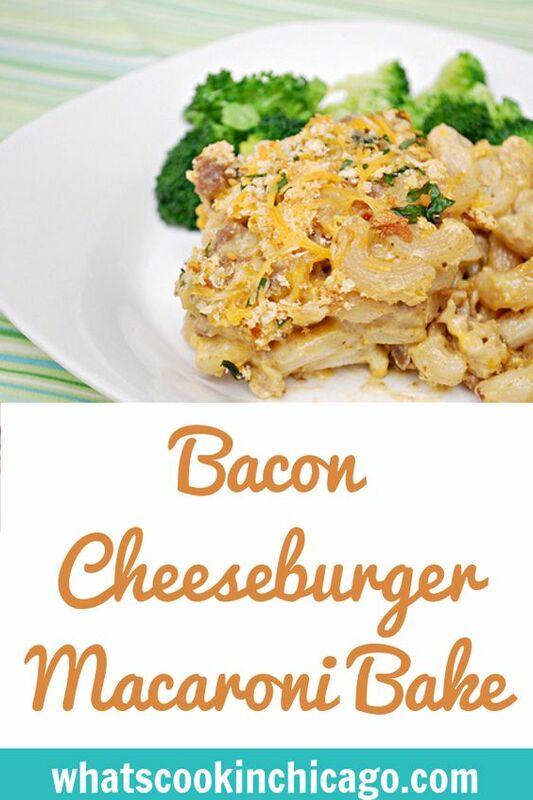 I love, love, love Mac and Cheese, and with bacon?! I love that you suggest using bacon fat. I recall my mother and grandmother always having a can to keep the bacon fat and reuse it. These days people are so fat-phobic they forget the rich, dense flavor even the smallest amount can add to a dish. Holy cow! I am from Vermont and I love love love Cabot cheese. My office was down the street from one of their outlet stores and you can go and sample all the different cheese varieties and sometimes we would just go and bring back a ton of different kinds of cheese and crackers for an afternoon snack. The Cabot Smoky Bacon Cheddar is amazing!